Greece is immensely diverse when it comes to culture. Spanning centuries of heritage with impressive archaeological remnants of its ancient era, you will be surprised to find out that there is much more to Greece than temples and monuments. The Greeks have been fervent advocates of entertainment since the ancient times. In fact, one of the 12 Olympian gods was Dionysus, the god of grape harvest, wine making and wine, of ritual madness, fertility, theater and religious ecstasy in ancient Greek religion and myth. So Greeks have a long standing tradition in revelry, one that is still kept alive until this day. Quite relevant to Greek revelry is a word that cannot precisely be translated into any other language; ‘kefi’ is an amalgam of many sentiments including joy, spirit, passion, excitement, having fun and loving life. It is an integral part of Greek lifestyle and has gone through many stages throughout the years and has taken many forms across geographic locations. Dancing is one activity that has ‘kefi’ at its core. However, traditional dances also have a more sombre note to them. Each region of Greece has its own local dance that tells a story by way of a spectacular performance giving visitors the unique chance to immerse into the most entertaining side of Greece. 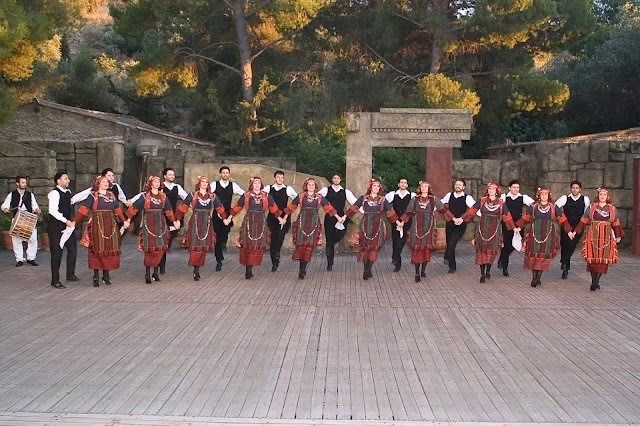 Keytours has included the Dora Stratou Greek Dancing Show in their Athens tours. Dora Stratou Dance Theater is a living museum, established in 1953, showcasing the most intriguing of Greek folk dancing. A splendid performance consisting of 75 dancers, musicians and singers perform dances from many regions of Greece, villages and islands. Each regional dance has its own attire that unilaterally represents the local heritage of its place of origin. Original costumes that are adorned with authentic jewelry and accessories are considered authentic museum pieces, having been handmade in these local villages more than a century ago. This tour is truly a fascinating one as it combines the element of visual and acoustic stimulation, with the assimilation into the Greek folk culture. The shows are 90 minutes long, and are an excellent choice for sending a wonderful evening as you unravel the fascination of Greek culture.